A while ago we wrote about the joys of seeing different casts in the same ballet. While classics such as The Sleeping Beauty do not leave much room for highly individual interpretations of the central roles they still provide an interesting study of technical and artistic abilities of different ballerinas. In that spirit we took advantage of a mammoth run (8 principal casts & countless performances between October & January this season) to watch 5 different Auroras and Prince Florimunds in the Royal Ballet’s exquisite production. 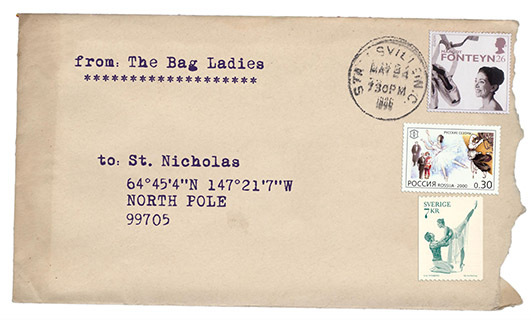 Forget Nicholas Ghesquière’s sacrilegious reinterpretation of this emblematic fashion house. We’re thinking Alina & Johan’s Sleeping Beauty has the same grandeur as Cristóbal Balenciaga’s original designs of the 50’s: superbly cut dance, rich in accents, clear in steps. Alina’s Rose Adagio is a thrilling display of how artistic maturity can make the impossible seem easy. One marvels at how she – whilst balancing on pointe – lowers her arms so slowly to take each suitor’s hand; or at the way she alternates her port de bras while zipping through piqué turns. 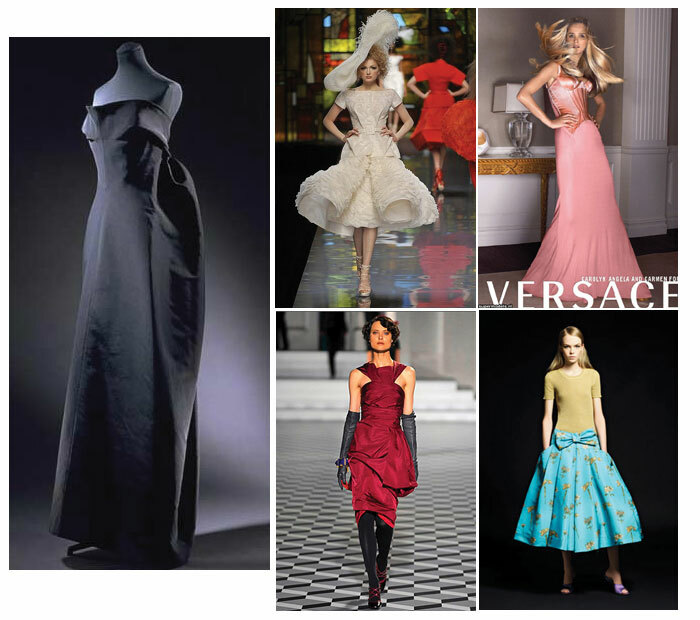 It all looks as easy and effortless as Balenciaga’s illustrious cape. And this most elegant of Auroras has the lucky draw of Kobborg’s perfectly tailored prince, the most attentive of partners. Like Dior’s maverick designer Obraztsova and Makhateli showed an incurably Romantic streak in their rendition of Sleeping Beauty. Softly touching the Prince in the Act II vision scene as if to tease him (the only Aurora to do this), Obraztsova creates a dreamy, young love mood. This is a pairing which was never too flashy or too daring, opting instead for polished dancing combined with Romantic touches like Dior’s perfectly cut, well structured taffeta gowns. Further reading here. This was a fun performance to watch. Young, bold, colorful just like the US fashion designer who gives traditional fashion cut a modern twist. We particularly loved the way this pair told the story: Marquez’s totally likeable, coquettish & sure-footed Aurora gradually melting the heart of McRae’s spoiled Prince. His passionate temper spoke volumes in the most exciting Act III variation we have seen over the last two seasons of Beauty. In the same way Versace is all about female empowerment, plunging necklines, sparkling fabrics and vertiginous cuts, so is Nuñez’s Beauty. She is radiant: her dancing razor-sharp, her Act II variation lush and sinuous. The wedding in Act III is a grandiose event where a fully grown, very womanly Aurora confidently takes centre stage. Soares was her fairytale Prince, handsome in posture and completely spellbound by this princess-goddess. This was a très chic Sleeping Beauty. Rojo & Pennefather’s polished reading for Aurora & Florimund seems cut in the same symmetrical minimalism – not a pleat in excess or out of place – as garments from this very stylish Italian fashion house. Any Auroras out there with a penchant for ultra-extended développés à la seconde (more on the evolution of this ballet step here) should watch Rojo’s demonstration of how “less is more” in classical ballet. Her balances are now the stuff of legends and her pure, classical style, so admired by Mr. Clement Crisp, is well matched by Pennefather’s danseur noble Florimund. His Ashtonian solo during the vision scene is an eloquent counterpoint to Aurora’s own Rose Adagio. While this is not the pair for those who need their romance with extra layers of pink, you could not wish for a more regal and musical Act III wedding pas de deux where Rojo’s trademark travelling fouettées in the coda are the bonus. The Royal Ballet’s Sleeping Beauties have just drawn to a close, giving way to the usual Christmas special of Nutcrackers. Notice anything in common? Both are Petipa ballets, both are amongst the safest for box office purposes, with blockbuster works such as Swan Lake and The Sleeping Beauty, their lavish costumes, orchestral music and vast ensemble of dancers, always in demand with regulars and first timers alike. Petipa ballets may be overly done, but they remain definitive classics, with great choreography which survived more or less unscathed over the years since their Imperial Ballet days. In this post we look at Marius Petipa and the scale of his achievements. This Franco-Russian choreographer changed the face of ballet and created masterpieces – the first ballets that come to mind when one thinks classical dance – that continue to inspire generations of dancers, new choreographers and audiences. Victor Marius Alphonse Petipa was born on 11 March of 1822 in Marseille son of an actress, Victorine Grasseau, and a ballet dancer (and eventually ballet master) Jean Antoine Petipa. Petipa got drawn into the ballet world early on, starting to train at age 7 in Brussels where his family had moved to. At the time, Petipa attended the Brussels Conservatory, where he studied music. He went to school at the Grand College. Initially Petipa danced only to please his father who wanted to see him perform. However, he soon became enchanted with the art form and progressed so fast that he debuted at 9 in his father’s production of Pierre Gardel‘s La Dansomani. With the Belgian revolution forcing the family to move again, Jean Antoine secured a job as ballet master at the Grand Théâtre de Bordeaux. There, Petipa completed his training under the watchful eye of Auguste Vestris. By 1838, he had a job as Premier danseur in Nantes. The following year Petipa and his father toured the United States performing for audiences who had never seen or known about ballet. While the tour was disastrous it had plenty of historical significance. Performing at the National Theatre in Broadway, Petipa was involved in the first ballet ever staged in New York City. From there Petipa travelled to Paris were he debuted at the Comédie-Française (or Théâtre-Français), partnering Carlotta Grisi and at the Théâtre de l’Académie Royale de Musique (Paris Opéra). In 1841 he returned to Bordeaux as a Premier danseur with the company, studying under Vestris while debuting in lead roles in Giselle and La Fille Mal Gardée. It was in Bordeaux that he started choreographing full-length productions. In 1843 he moved to the King’s Theatre in Madrid where he learnt about traditional Spanish Dancing which would come in handy for making character dances later on. He was forced to leave Spain after being challenged to a duel by a cuckolded husband, the Marquis de Chateaubriand, an important member of the French Embassy. Back in Paris, he took a position as Premier danseur at the Imperial Theatre of St. Petersburg where he arrived in 1847. His father soon followed, becoming a teacher at the Imperial Ballet School until his death in 1855. Upon his arrival in St Peterburg, Petipa was recruited to assist in the staging of Joseph Mazilier‘s Paquita (originally staged at the Paris Opéra). Helped by his father, he also staged Mazilier’s Le Diable Amoureux. Both productions were praised and Petipa’s skills brought much needed respite to a company then in crisis. Towards the end of 1850 Jules Perrot arrived as Premier Maître de Ballet (Principal ballet master) for the St. Petersburg Theatres. His main collaborator, composer Cesare Pugni, had also been appointed as Ballet Composer at the Imperial Theatres. 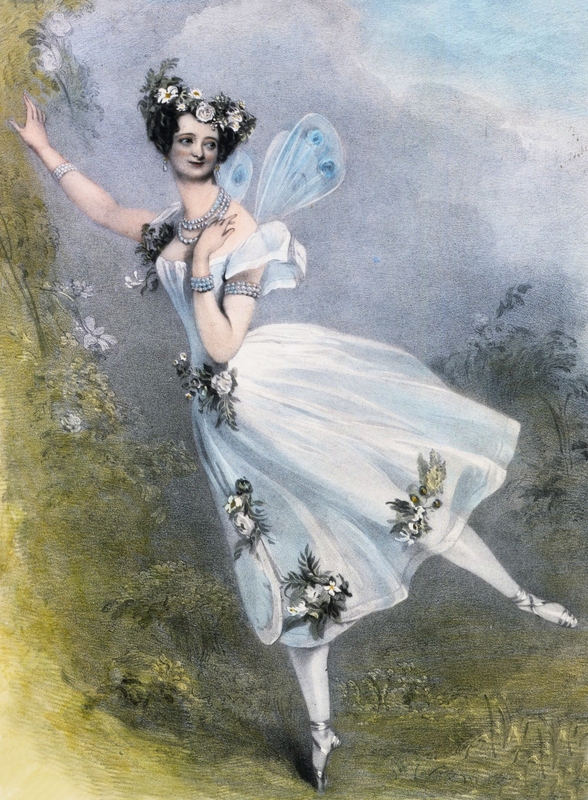 Petipa danced the main roles in Perrot’s productions and served as his assistant, staging revivals such as Giselle (1850) and Le Corsaire (1858). In parallel Petipa started to choreograph dances for opera and to revise dances for Perrot’s productions. Petipa was now choreographing more frequently, making ballets for his ballerina wife Maria Sergeyevna Surovshchikova. A rivalry with Arthur Saint-Léon, the new Principal ballet master after Perrot’s retirement (1860) developed, the two competing for the most successful production. But while Saint-Léon’s The Little Humpbacked Horse was very well received he flopped with Le Poisson Doré (1866) and Le Lys (1869) which led to his contract not being renewed. Not long afterwards Saint-Léon died of a heart attack leaving an opening for Petipa to fill the position of Premier Maître de Ballet (March, 1871). Staged Don Quixote at the Moscow Imperial Bolshoi Theatre. 1898 photo of Petipa's ballet "The Pharaoh's Daughter", Mathilde Kschessinska as Princess Aspicia and Olga Preobrajenska as Ramzé the slave. Photo: Imperial Mariinsky Theatre. When Don Quixote was lavishly restaged in St. Petersburg its composer Ludwig Minkus became official Ballet Composer of the Imperial Theatres, leading Petipa and Minkus into a fruitful collaboration, with La Bayadère (1877) becoming one of Petipa’s most celebrated works. Minkus retired in 1886 and Director Ivan Vsevolozhsky did not seek a replacement official composer, allowing instead for more diversified ballet music. This paved the way for Tchaikovsky to collaborate with Petipa in The Sleeping Beauty (1889) and create one of the most successful classical ballets of all time. At that time Petipa was diagnosed with a skin disease which meant long periods away from work. 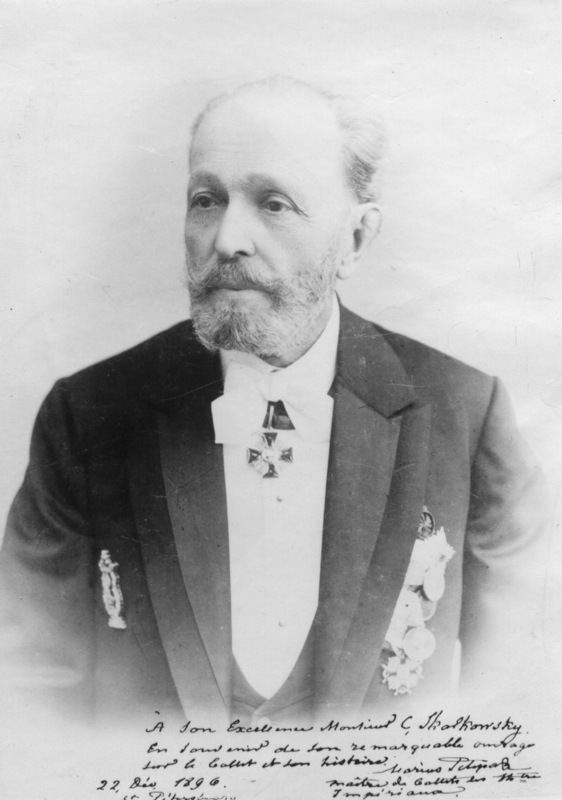 For The Nutcracker (1892) Tchaikovsky worked with Petipa’s assistant Lev Ivanov who would frequently cover for Petipa together with Enrico Cecchetti. Created a final ballet, L’Amour de la Rose et le Papillon, which was scrapped before its premiere by Telyakovsky due to the impending war with Japan. Petipa will be forever associated with lavish productions, character and classical dances, big ensemble and dramatic scenes in mime or in pas d’action (mime with dance). His dances combine the technical purity of the French school with the virtuosity of the Italian school. He was very involved in the creation of his ballets, researching subject matter extensively and working close with the composer and designer. He created choreography before going to the studio and teaching it to his dancers. He produced more than 46 original works and revised many more (e.g. Giselle), of which a large share is still being performed today. Petipa’s ballets have survived more of less intact thanks to the availability of the Stepanov Method of notation from 1891 onwards. The method combines the encoding of dance movements with musical notes, in two steps: first, the breaking down of a complex movement and second, the translation of the broken down/basic movement into a musical symbol. The project was taken over by Alexander Gorsky and eventually by Nicholas Sergeyev, a former Imperial dancer, who later brought Giselle to the Paris Opéra Ballet and The Sleeping Beauty, Giselle, Coppélia and The Nutcracker into The Royal Ballet. These notated versions became the standard choreographic text and have been adopted by nearly every major ballet company in the world. This week we have double reason to party. While at Covent Garden the Royal Ballet returns home for the 2009/2010 season, over here at the Ballet Bag we celebrate 6 months of online balletomania. To mark the occasion we have prepared a – non exhaustive – balletic timeline of sorts, to highlight some of our favorite posts over this period. We hope you enjoy! Go If: You love classical ballet complete with fairy tale theme, tiaras, tutus, lavish décors and variations for almost every single dancer featuring every single ballet step. The Sleeping Beauty is also ideal for: classical music fans who want to live Tchaikovsky’s vision of the story, young budding ballerinas and danseurs looking for inspiration and first timers, who will be able to easily follow the story. Skip If: You cannot bear choreographic “filler”, endless variations and character dances (particularly in the prologue and act 3), long mime sequences (as in the Royal Ballet’s version), happy ever after fairy-tales or overly long ballets – think 3 hours including intervals. Aurora: There is currently no better Aurora in our books than Alina Cojocaru. Prince Désiré/Florimund: Beauty is more centered on the ballerina so the Prince’s role is secondary. However, the male solos are a perfect showcase for danseur nobles such as Mariinsky’s Igor Kolb, ABT’s Marcelo Gomes, NYCB’s Robbie Fairchild and Roberto Bolle. At the Royal Ballet we think rising star Sergei Polunin (who is tackling the role for the first time this season) and Rupert Pennefather are very princely. Lilac Fairy: Ulyana Lopatkina, Veronika Part and Marianela Nuñez. In 1888 Ivan Vsevolozhsky, Director of the Imperial Theatre in St. Petersburg, had the idea of adapting Charles Perrault‘s tale of The Sleeping Beauty into a ballet and invited Tchaikovsky to compose the music. It was a bold move at a time when fairy-tale based ballets were in low public demand and largely viewed as theatrical gimmicks. Tchaikovsky’s Swan Lake (as choreographed by Wenzel Reisinger/Joseph Hansen) had been coldly received and Petipa‘s ballets were not faring well. However visionary Vsevolozhsky, a diplomat who had also served as librettist and costume designer, seeing the potential for Petipa and the talents of the Imperial Theatre, jumped at the chance to develop a lavish production of this well loved story in the style of those staged in the court of Louis XIV. Tchaikovsky didn’t hesitate in undertaking the commission. Immediately taking instructions from Petipa as to the particular requirements (e.g. bar lengths, type of music, character leitmotifs, etc. ), he worked fast and it is thought that he completed the overture, prologue and outlines of acts I and II in less than three weeks. Tchaikovsky finished the ballet score at the end of May 1889, having spent a total of 40 days on it. In a letter to one of his benefactors he wrote: “The subject is so poetic, so inspirational to composition, that I am captivated by it”. Rehearsals began in August of that same year. The premiere, originally scheduled to take place that December, kept being pushed forward until the ballet was finally staged on 15th of January 1890. By then the Tsar, who had been invited to the dress rehearsal, had already given it his verdict, laconically telling a puzzled Tchaikovsky that the music was “very nice”. 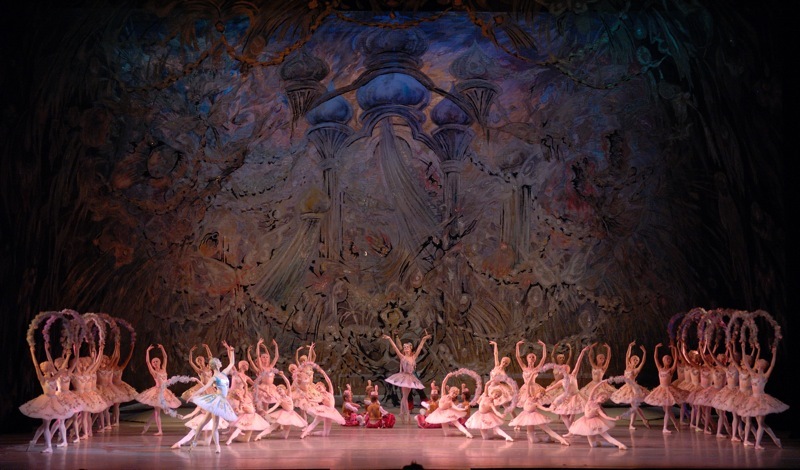 Vision Scene in Mariinsky's The Sleeping Beauty. Source: Mariinsky.ru Copyright belongs to its respective owners. Mixed reviews for the splendid January 15th premiere showed that the audiences had been captivated mostly by the beauty of the music, even if it was constantly referred to as “symphonic”. The libretto was seen as simplistic and juvenile, designs too luxurious (the ballet consumed a quarter of the theatre’s annual budget). Later however, the ballet would captivate the hearts and imagination of a younger generation of enthusiasts. Referred to as the “Neva Pickwickians”, personalities such as George Balanchine, Alexandre Benois, Léon Bakst, Sergei Diaghilev, Igor Stravinsky and Anna Pavlova, were greatly impressed by the artistic qualities of the production, giving it a boost which helped The Sleeping Beauty become the most performed ballet in the Mariinsky’s history. 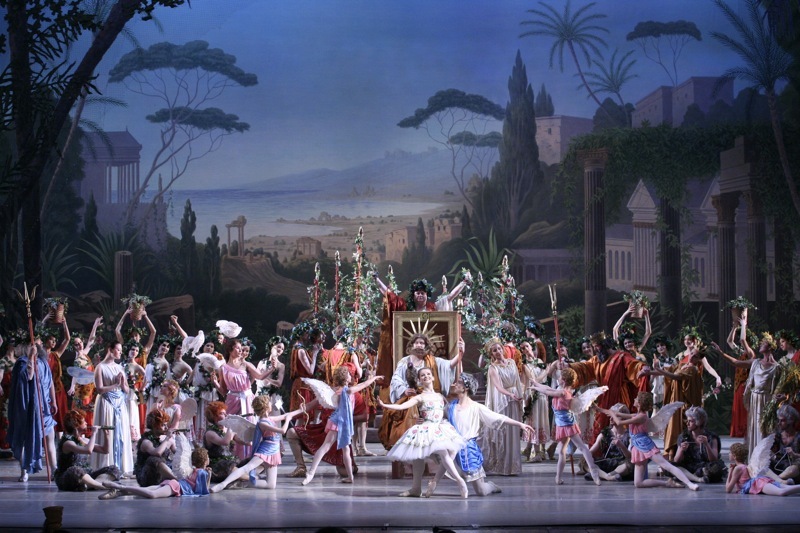 This historical 1890 production was revived in 1999, thanks to its reconstruction by Sergey Vikharev who worked with the original notations by Petipa’s assistant Nicholas Sergeyev, as well as other productions which borrowed from it (Perm Ballet’s 1922 production by Fyodor Lopukhov, the Bolshoi‘s by Grigorovich, the Mussorgsky Theatre of Opera and Ballet’s and the Royal Ballet‘s by Sergeyev himself), where necessary filling in the gaps with the Kirov’s 1952 version – the Soviet Beauty – as staged by another Sergeyev: Konstantin Sergeyev. The Sleeping Beauty was performed outside Russia for the first time in 1896 in Milan. While In St. Petersburg, with the revolution under way, the production went into decline, it flourished in the West thanks to Diaghilev and his Ballets Russes. Their 1921 staging in London of The Sleeping Princess, in a new full-length version (they also had a 45-min shortened version, Aurora’s Wedding) with designs by Léon Bakst, new orchestrations by Stravinsky and revised choreography by Nijinska had a record 105 consecutive performances and was considered a success even though it had dire economic consequences for the company. 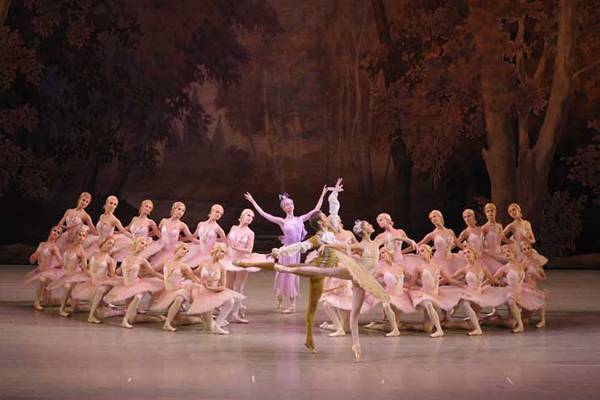 The Sleeping Beauty has a special place in the Royal Ballet’s repertoire. It was originally staged for it in 1939 by Nicholas Sergeyev who had fled the Russian revolution with the original Mariinsky notations in his suitcase, with nineteen year old Margot Fonteyn in the role of Aurora. This was also the “statement ballet” chosen by Ninette de Valois to commemorate the end of WWII, as well as her budding ballet company’s new home at the Royal Opera House. Oliver Messel was brought in for the designs and Margot Fonteyn and Robert Helpmann danced the leads Aurora and Prince Florimund/Carabosse. The ballet had its premiere on February 20, of 1946 and became a symbol of the company triumphing against adversity not only at home but on tour in the US, with Fonteyn’s Aurora acclaimed by New York audiences. 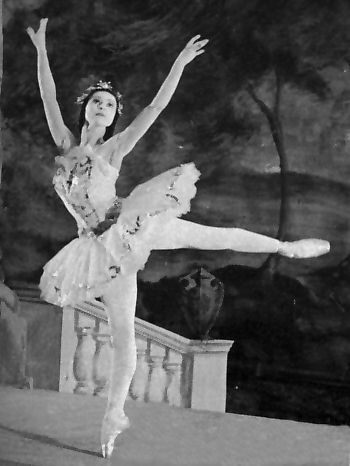 Margot Fonteyn as Aurora. Source: Dance Works Online via My Hero.com. Copyright belongs to its respective owners. The 1946 production was revived by the Royal Ballet in 2006, to celebrate its 75th anniversary and remains in repertoire as their current production. It is also available on DVD. Petipa and Vsevolozhsky based their ballet’s libretto on the original fairy tale by Charles Perrault later popularised by the Brothers Grimm. Since the libretto’s priority is to blend the story with the dancing, there are modifications from the source text and, evidently, slight changes from one company’s version to the next. who soon arrive to bestow on the Princess gifts and virtues of, respectively, purity, beauty, generosity, musicality and vitality, each dancing a solo representing her trademark virtue. Before the Lilac Fairy has the chance to present her gift (wisdom) she is interrupted by the arrival of Carabosse, the wicked Fairy, furious with the King and Queen for not having been invited. The King calls on Cattalabutte to investigate and his Master of Ceremonies admits Carabosse had been omitted from the guest list. She grabs Cattalabutte and rips off his wig. Ignoring the fairy godmothers’s pleas and ridiculing them, she proceeds to place a curse on the princess, who will grow up to be very beautiful but ultimately prick her finger on a spindle and die on her sixteen birthday. As the court panics the Lilac Fairy, who was yet to give her gift, promises that if Carabosse’s curse ever materializes, then Aurora will not die, but fall into deep sleep for 100 years, awakening once she is found by a Prince from a faraway land who shall give her true love’s kiss. 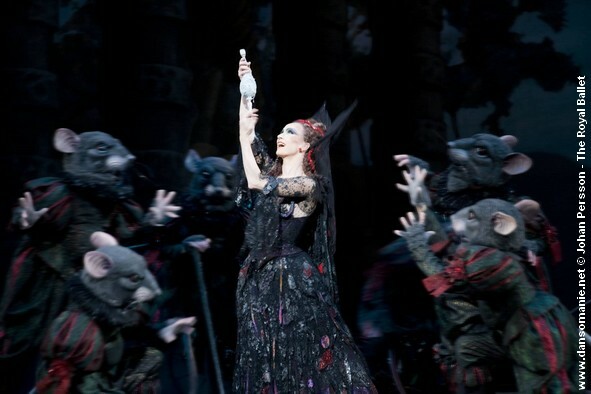 The Royal Ballet's Genesia Rosato as Carabosse Source: Opusarte. Copyright belongs to its respective owners. It is the eve of Princess Aurora‘s sixteenth birthday and the whole kingdom is celebrating. While villagers dance with flower garlands a small group of women is seen knitting, a forbidden activity which carries a death penalty since the King has banned all sewing objects from his kingdom. Cattalabutte reports them to the King, who decrees that the women should be hanged, but the Queen intervenes and pleads for mercy. Since it is his daughter’s birthday he reconsiders and the festivities resume. Four princes arrive from far away lands (they are referred to as the French, Spanish, Indian and Russian princes) to meet the princess and offer her gifts of exquisite roses. Aurora’s friends enter and just after that Cattalabutte annouces the Princess’s arrival. As the music becomes as fast as heatbeats, Aurora bursts onto stage dancing quick jumpy steps which convey her youthful innocence. The King and Queen greet her asking her to dance with the princes as she is now old enough to marry. She receives them charmingly and dances what is called the Rose Adagio, one of the most testing pieces for a classical ballerina as she is required to do multiple balances on pointe center stage whilst being courted by each prince, making each of them completely taken with her beauty. After this technical tour de force, Aurora returns to dance a solo for the princes, which she does in a part coquettish, part bashful way, like a typical teenager. Just then an old lady appears and presents her with a spindle, which she grabs with curiosity since she had never seen one. She dances with it, while her mother and father watch with a mixture of apprehension and terror as Aurora pricks her finger and collapses. The old lady reveals herself as Carabosse, laughing triumphantly and vanishing before the Princes can fight her. The Lilac Fairy then appears to remind everyone that the Princess will not die. She puts the entire kingdom to sleep, to awaken only once Aurora‘s curse is broken. One hundred years have passed and Prince Désiré/Florimund is hunting with friends. They try to entertain him with games and dances but he does not seem interested. As his party departs in pursuit of a stag, he lingers behind alone in the forest. The Lilac Fairy appears and shows him a vision of Princess Aurora, and as he dances with this vision he falls in love. He pleads to be brought to the Princess, and the Lilac Fairy takes him to a castle hidden beneath layers of ivy. At the gates they encounter evil Carabosse who tries to prevent the Prince from entering, but the Lilac Fairy repels her and the Prince finally awakens Aurora with a kiss. Désire/Florimund declares his love for her and Aurora agrees to marry him. Marianela Nuñez as the Lilac Fairy. Source: OpusArte. Copyright belongs to its respective owners. Festivities are held to celebrate the nuptials of Princess Aurora and Prince Désiré/Florimund. Various fairy tale characters join the festivities including Puss in Boots and the White Cat, the Bluebird and Princess Florine, Little Red Riding Hood and the Wolf among others, the highlight here being the Bluebird Pas de Deux, in which the male soloist has to perform a fiendish diagonal of Brisés volés mirroring a bird in flight. The beautiful grand wedding Pas de Deux ensues, the choreography showing us a more mature Aurora – more poised and confident than the 16 year old from Act I – and her elegant, danseur noble, prince. They are joined by their guests in a mazurka and the ballet ends with the The Lilac Fairy blessing the newly wedded couple. Tchaikovksy’s score lasts 3 hours so it is usually cut for the ballet. There are two main leitmotifs, one for Carabosse (the angry sounding first part of the overture) and other for the Lilac Fairy (the calming second part) and both often develop from one another. This review of ABT’s Sleeping Beauty by NY Times dance critic Alastair Macaulay contains some great insights into the musical themes set by Tchaikovsky. Original Cast: Carlotta Brianza as Aurora, Pavel Gerdt as Prince Désiré, Marie Petipa as the Lilac Fairy, Enrico Cecchetti as the Bluebird and Varvara Nikitina as Princess Florine. Premiere: St. Petersburg, Imperial Mariinsky Theatre, 15 Jan 1890. Choreography: Marius Petipa, with additional choreography by Sir Frederick Ashton (Act II, Aurora’s Variation and Prince’s Variation and Act III: Florestan and his sisters after Petipa), Anthony Dowell (Prologue: Carabosse and Rats and Act III Polonaise and Mazurka assisted by Christopher Carr) and Christopher Wheeldon (Act I: Garland Dance). Performance Notes and Programme for The Royal Ballet’s Sleeping Beauty (2008) including The Sleeping Beauty by Clement Crisp, A Cinderella Story for a Sleeping Princess by Tim Scholl and The Good, the Bad and the Symphonic by John Warrack. From the moment Marie Taglioni put on her ballet shoes and stood on pointe the cult of the ballerina took flight. The ballerina, the female expert in the art of ballet who lives and suffers for her art, is forever associated with intrinsic qualities of lightness and grace. But just like Mr. Darcy’s remarks on truly accomplished women (“no one can be really esteemed accomplished who does not greatly surpass what is usually met with… she must possess a certain something in her air and manner of walking, the tone of her voice, her address and expressions, or the word will be but half-deserved”), should we not also comprehend a great deal in our idea of a graceful dancer? A while ago we were asked by one of our Facebook group members to write a comment on what makes a dancer graceful. This post attempts to approach this delicate topic (since not every ballerina is a synonym for gracefulness) from an audience perspective. Technique, which forms the basis, the backbone of a dancer’s art, is an objective measure. But grace, like artistry, is subjective and largely depends on the eye of the beholder. For evidence of that one only needs to take a tour of ballet on YouTube. Pick a male or female dancer you like, watch a selection of videos featuring that dancer and try to form your own views. Then read the various comments in reaction to his or her performance: for every person who finds your chosen dancer graceful there will always be a dissenting voice. The FT critic Peter Aspden made interesting remarks on this when he wrote a very interesting article about the Mariinsky’s Alina Somova, a controversial dancer who continues to spark inflamed debate on YouTube and on ballet related web boards because of her use of extreme extensions in classical ballet. Some, like Aspden, perceive her as extremely graceful, while others see exactly the opposite. Musicality – the most obvious way to define a musical dancer is to think of the music box ballerina cliché. A highly musical dancer will trick you into forgetting about the orchestra pit and thinking that his or her movement is creating the music, so well they are matched. It goes beyond being technically precise. Of course, it should be noted that choreographers will treat music differently and the dance can either be on top of the melody or purposefully dissociated from the music, as is the case in certain modern choreography (ie. Merce Cunningham). A dancer that is often acknowledged as having been extremely musical was Balanchine‘s muse, Suzanne Farrell. Physical qualities – one cannot underestimate the importance of well proportioned limbs and a beautiful face in ballet. On the other hand there are dancers who have broken the mold, redefining the concept of perfect proportions. These can be some of the most exciting dancers to watch because they transform what might have been perceived as a drawback into strength and create a form of unconventional grace. For examples of dancers who break the mold, see Alina Somova and Edward Watson making the most of their elastic and slender physiques in, respectively, Ratmansky’s The Little Humpbacked Horse [link] and Wayne McGregor’s production of Händel’s Acis & Galatea [link]. And here we feature some of our favorite graceful dancers who combine all the elements above. Feel free to post yours if you have one! Sarah seems to be floating on a cloud of dance, her movements so light and fluid, every step a music note. This is a beautiful rendition of the famous Spessivtseva solo (Giselle’s first act variation) in which every single movement is linked into a whole. Notice how softly she gets down from arabesque into penché, her arms lingering with the music. While the dancers above represent the “ethereal and petite ballerina” we have a contrasting example in Tereshkina, a tall dancer who looks poised, elegant yet delicate in one of the most graceful choreographies in classical ballet. Around 3:39 you can see Odette’s variation. Makarova was the quintessential ballerina, a perfect match between technique and artistry: every step is used as a means for conveying emotion. A really graceful and touching performance. The Mariinsky visit to London a few weeks ago and in particular the fact that they brought mime-less Soviet adaptations of ballet classics with them, generated much discussion among Covent Garden audiences about the importance of mime in ballet. When Konstantin Sergeyev revisited works such as Swan Lake, The Sleeping Beauty and Le Corsaire in the 50’s, balletic mime was largely scrapped in Russia as it was considered that new audiences did not need to be exposed to something as old fashioned and reminiscent from Tsarist times. The West would follow suit later on when it considered that dancing should be a complete means of storytelling with no additional form of narration. Mime became moot. But well performed balletic mime can be as artistic and as beautiful to watch as the dance itself. It carries forth the story, putting it into context. For instance audiences watching the Mariinsky’s Sleeping Beauty will be given no clues that the Lilac Fairy reverts Carabosse’s curse to princess Aurora by reassuring the whole court that if she pricks her finger she will fall into deep sleep but not die. Of course there is an argument that many of us will be familiar with this fairy tale and that we do not need such level of detail in performance. On the other hand, omitting the Lilac Fairy mime means depriving audiences of one of ballet’s most moving sequences as this passage assists in developing her character, conveying a full sense of the Lilac Fairy‘s warmth, kindness and wisdom as well as the contrast between good and evil, her calming gestures opposing Carabosse’s jerky, angry movements. All this is achieved by working the upper body, with face, arms and hand gestures that are completely integrated to Tchaikovsky’s beautiful score. Balletic mime is a stylish work of art. Hands circle one another above the head, the arms moving from first to third position. Character touches the forehead with the index finger. Crosses arms in front of body in a low position. Character makes a circle around the face with the palm of the hand. Point two fingers, held together (like a peace sign) upwards in the audience’s direction. Ex: in Swan Lake, when Prince Siegfried promises to Odette that he will marry her and thus break the swan curse. Move forward to 2:30 to see the full mime sequence where Berthe (Genesia Rosato) tries to warn Giselle (Alina Cojocaru) about the dangers of too much dancing. She will tell all villagers of the presence of Wilis in the forest who come out late at night to prey on wandering men. Note the miming of: cemetery/burial grounds (the crosses), wilis (the wings, the hand on her chin) dance and die. In the prologue of the Royal Ballet’s current production of The Sleeping Beauty you can see the complete sequence where Carabosse crashes Aurora’s christening and curses her, miming the gestures: forgot, listen, say, grow up, beautiful, die. The Lilac Fairy interrupts (“now you listen to what I have to say“) miming that if Aurora pricks her finger she will sleep until awakened by a kiss from a faraway land Prince. Move to 1:40 to see the full mime sequence in this video of Kevin McKenzie’s Swan Lake production for ABT. The promise sign is mimed twice, first by Odette (Gillian Murphy) when she is telling her story to Prince Siegfried (Ángel Corella) and then by the Prince. Odette also uses mime to explain she is the Queen of the swans. Royal Ballet’s Johan Kobborg characterised as Madge tells James’s fiance Effie and her friends their fortunes in this Bolshoi staging of La Sylphide (Move forward to 0:35). Notice how Madge predicts that Effie shall marry Gurn instead of James.